And now, with just 36 hours to go in this successful campaign, the puzzle that needs no introduction ... the metapuzzle. Back at the beginning of this campaign and the free mini puzzlehunt, we told you that all the puzzles would combine to form a larger puzzle, embodied by the metapuzzle, the denouement and raison d’être of the puzzlehunt, resulting in a satisfying conclusion. One important aspect of a good metapuzzle is that you don't need all the other puzzles' answers, but the more you have, the easier the metapuzzle is. Usually, there's a tipping point, a number of answers that you absolutely need or you can't unlock the final answer to the metapuzzle. In this case we've done something a bit different. We think you can solve the metapuzzle with anywhere from 0 to 17 of the answers to the other puzzles. If you've solved a lot of those puzzles -- or all 17 of them -- then, you'll have a lot of answers to plug in and the metapuzzle should go very smoothly. If you have fewer, it's going to be more of a challenge. Whichever it is, we hope you enjoy it. Use the links below to download the puzzle. If you get stuck in the metapuzzle, we've designed it so that you'll have a good idea for which one of the 17 puzzles you want to go get the answer to. As we close out the campaign, we want to thank you for joining in and supporting both this campaign and Puzzazz. It's been a lot of fun for us too, and we're looking forward to what's in store in the next year. After the campaign, the Year of Puzzles will be available for purchase in the Puzzazz app for iOS (and other platforms in the future) as well as on our web site, so please don't stop telling your friends how much you've enjoyed this. Is 46 Down correct? 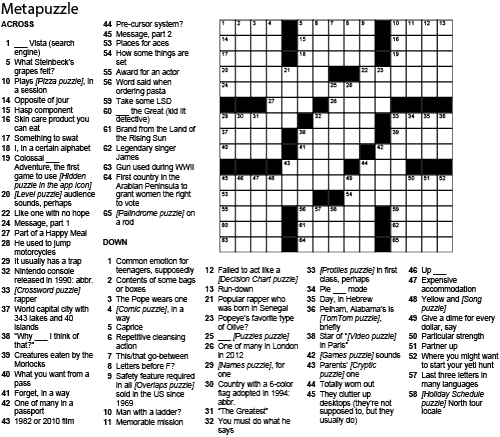 We couldn't make any word that made sense, particularly with 63 Across. Did finally solve it without. 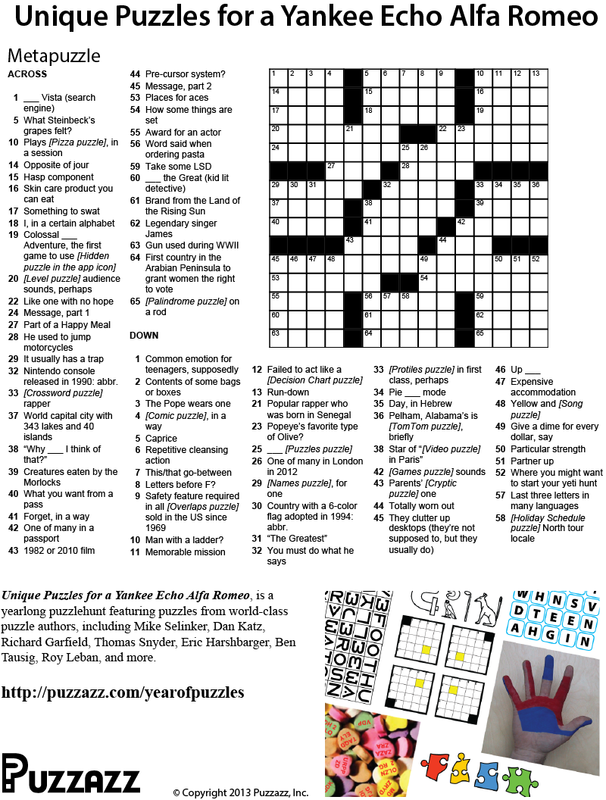 Congrats to Ken and everyone who's finished the mini puzzlehunt so far. We want that stretch goal (and the next one! ;-) just as much as you do.